Africana women (meaning Black women of Africa and the Diaspora) are the first teachers of their children and in many cases the primary breadwinner, the community advocate, and a creative force within the family. 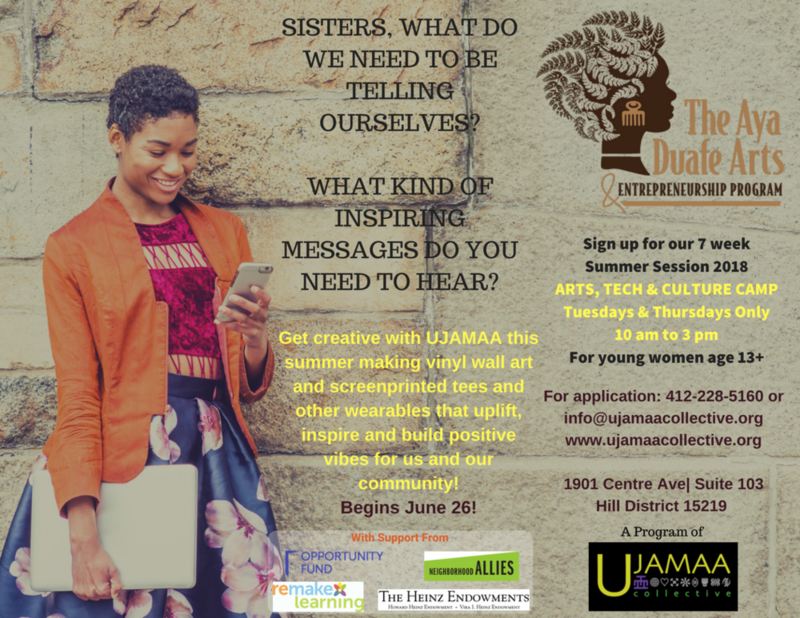 The women Ujamaa Collective serves and impacts range from teenagers to grandmothers. It is our goal to harness these qualities to support women to create agency within their own lives, enhancing their innate skills and teaching new proficiencies to help them in determining where they want to go. Ujamaa Collective understands the needs of these women: what is unique in our approach to the alleviation of social ills and creating an empowering legacy in these common situations is the interdependence of extended family and kinship groups combined with adherence to a collective system of values and codes. With the Nguzo Saba as our primary code, as well as product guidelines and ethical behavior for the marketplace drawn out from the Adinkra symbol system of West Africa, Ujamaa is tapping into the best our cultural legacy has to offer. All of these principles and values have been applied and tested within our individual businesses and community lifestyles, and we acknowledge the positive change they have helped cultivate in our formal and informal relationships. click here for APPLICATION due June 21, 2018. Hurry, spaces are limited! To learn more about what's in store for participants of our summer program, click here. The artisan boutique is the flagship of our non-profit services offered to low-income handmade artists. This retail program gives much-needed support to artists through marketing, merchandising and sales. Since its inception, we have served over 140 independent artists and entrepreneurs and engaged thousands of customers. Local residents in the Hill District affectionately refer to us as “the African store on Centre Ave.” Our location has been a regional destination point for visitors, students and shoppers on tours through the historic Hill District. We welcomed groups from Ireland, Ghana, France, China, South America and across the United States for merchandise, conversation, food and culture. The handmade works we offer in the boutique are made by local, regional and international artists from a number of disciplines that need opportunities for self-sufficiency and wealth creation. We know that many of the same impoverished conditions faced by women and families in developing countries can be found right here in Pittsburgh’s own low-income communities such as the Hill District. Advocating for fair trade locally and abroad, Ujamaa Collective’s boutique gives members and others a collective space to exhibit and market their work. In November of 2015, we launched our first Ujamaa-branded line of skirts and accessories called Royal Roots Collection. Royal Roots was birthed among Ujamaa’s members and a partnership with an NGO based in Karagwe, Tanzania in East Africa called KVDPA. Designed locally, the skirts were produced over a two week trip in a fair trade exchange of labor with women and youth learning sewing skills as a strategy to reduce poverty in their global community. It is our intention to continue building upon this relationship, applying for Fair Trade certification and bringing an international flair into the local Greater Pittsburgh market. Fair trade places fair monetary value on the unique skills of Africana women and artisans, providing an economic and moral boost which leads to more gender equality in the family and community. It means paying a fair price or wage in the local context and providing equal employment opportunities. It also means engaging in environmentally sustainable practices, providing safe and healthy working conditions, and being open to public accountability. Fair trade is environmentally, economically and culturally sustainable and gives local communities the opportunity to self-empower. October is held internationally as Fair Trade month, acknowledging the importance of fair and direct monetary exchange for the goods produced by our people whether they reside across the ocean or in our own neighborhood. 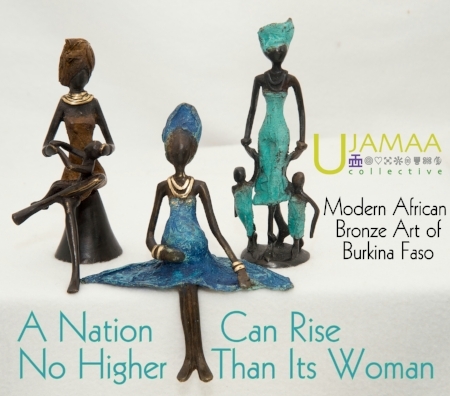 Ujamaa Boutique is working hard to ensure our shop offers opportunities for our neighbors to have healthy exchanges for goods and services with one another, made locally by Africana artists and other global crafters around the world. Remember to stop in for your gifts to self and others, supporting those who are working creatively to support themselves! Just as the originator’s of the fair trade movement were stirred to open up economic channels after witnessing the hard work and creative endeavors of our international brothers and sisters and seeing them not receive their fair share, Ujamaa was formed similarly to make a difference. Fair Trade is just as relevant in impacting poverty in the United States as it is across the waters in foreign countries. A local woman learning how to help herself helps her children and her entire family. Multiple women working together transforms the community. Ujamaa Collective is doing its best to combine cultural ethics with cooperative business practices to help lift as we climb. On limited incomes, many of us look for the deal or the lowest price- although that doesn’t always guarantee the best quality. While the handmade artist must cover all expenses, from business overhead, the cost of supplies and the value of their time like any other big business, it is very difficult to compete with similar items factory-manufactured cheaply in other countries. Economics is a relationship of value, worth and choices- let’s do our best to choose the options that support more of what we care about and not less.